This week I spoke with two hungry taco journalists Mando Rayo and Jarod Neece. Mando Rayo is an author, taco expert, blogger and CEO & Engagement Strategist at Mando Rayo + Collective, a multicultural digital agency based in Austin, TX. Jarod Neece has been with the South by Southwest (SXSW) Film Festival since 2002 and is currently a Producer and Senior Programmer. Together they also co-authored Austin Breakfast Tacos: The Story of the Most Important Taco of the Day and have published their most recent book Tacos of Texas. Tune in to hear their recipe for incredible tacos! 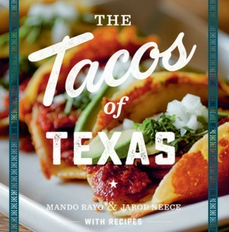 Connect with Tacos of Texas on online and head to your local bookstore to pick up a copy of Tacos of Texas!